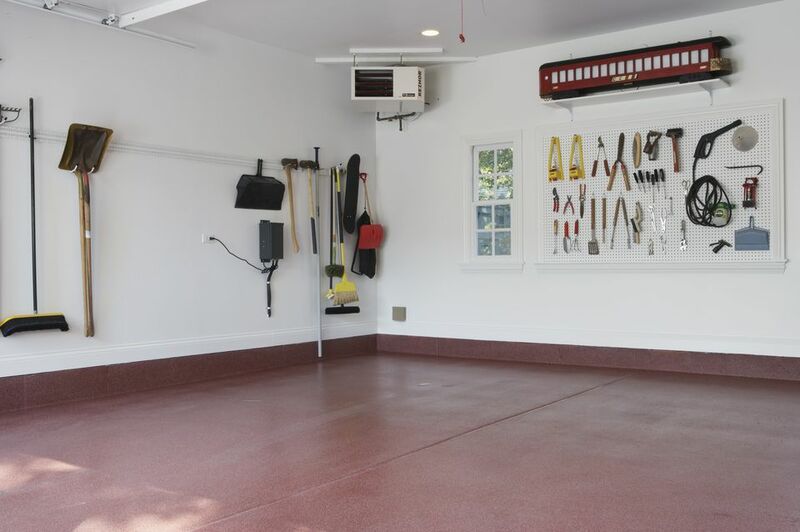 The spreading popularity of garage makeovers has spawned a variety of wall storage systems aimed at residential garages. Many of these systems have their origins in commercial kitchens and retail establishments, but there is no denying that they can help create a very functional and even attractive storage system in your garage. Metal standards and brackets probably don’t qualify as a formal wall system, but they nonetheless offer terrific low-cost shelving. In a garage with unfinished walls, the standards can be attached directly to exposed studs. You can put shelves as high and as low as you like on the wall, and you can run them from one end of a wall to the other. Pegboard (perforated hardboard) is available at home centers and lumberyards. It is inexpensive, easy to install, and provides a ready-made surface for a wide variety of storage hooks, racks, shelves, cords, and other accessories. Attach the pegboard directly to studs in a garage with unfinished walls or use spacers over drywall to hold the panels away from the wall so that hooks can be inserted and removed. Use 1/8-inch pegboard for light items and 1/4-inch pegboard for heavier items, but be sure to match the hardware you buy with the size of pegboard you use. Wall tracks are composed of metal rails that are attached horizontally to studs. One product offers a decorative plastic piece to hide the rail. Rails are available in lengths of 48, 56 and 84 inches. Once the rail is in place, you can attach a wide variety of hooks, baskets and other holders. Wire grid systems are another easy to find, install, and use system. Grid panels are available in sizes ranging from 2 x 4 feet to 4 x 6 feet, and you can easily cover an entire wall using several panels. The grids are made of metal, which is sometimes coated, and attach to the wall with clips and spacers. Hooks, baskets, shelf brackets, tool racks, document holders and bin rails and stacking bins are some of the accessories you can attach to the grids to create customized storage.